Terraforming Mars: Turmoil, and a Terraforming Mars Legacy. Terraforming Mars: Turmoil, the 5th expansion for TM is underway, we have taken a look at 2 new corporations, the politics, and global events. 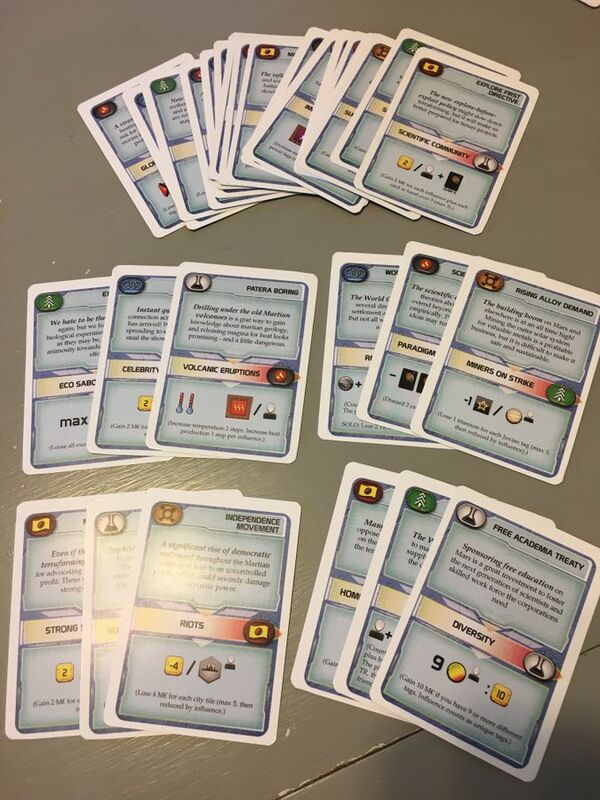 Also, a Terraforming Mars Legacy game is being designed this very moment! 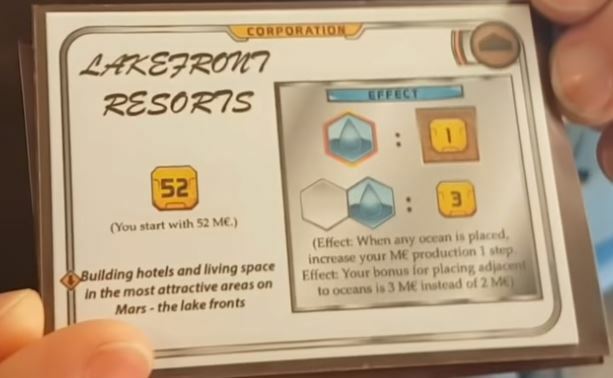 The rumoured fifth and sixth expansions of Terraforming Mars seems to be merged to one, to be released sometime after summer 2019, and testing of the expansion is in full swing. This expansion will be named Turmoil and the main focus will be events; Global Events, which will be in a seperate deck, and cooperative projects, where one would asume the players work together to finish projects and share the bonuses, and perhaps share the penalties if it fails alá 7 Wonders: Babel. Another focus will be politics, which is discussed further down in the article. There will be new corporations aswell, a Jovian based one and a corp focusing on oceans, according to the rumours, the latter has now been confirmed. The latest data suggests there will be 5 new corps; Utopia, Terralabs, Lakefront Resorts, Pristar, and one more. Fryxgames has released a sneak peak on two of these new corporations from Turmoil, Terralabs and Lakefront Resorts. Terralabs starts with just 20 MegaCredits (MC), and one less Terraforming Rating, but all cards costs 1 MC instead of the normal fee. This means you could buy your whole starting hand for just 10 MC, and all the cards in your research phase for just 4 MC. Very powerful indeed. The corporation has Science and Earth tag. Terralabs seems VERY powerful. This card is a Prototype. The other corporation we've seen is Lakefront Resorts, a much more classic type of corp. It has a Building tag, starts with 52 MC, and like the name suggests, has something to do with lakes/oceans; When any ocean is placed, this corporation increases their MC production 1 step. Nice. But the interesting thing about this corp is the other effect, that placing tiles next to water gives you 3 MC instead of the normal 2. So, lakefront indeed. These cards are still in development, and Fryxgames emphasises that they might change. Nevertheless, interesting! 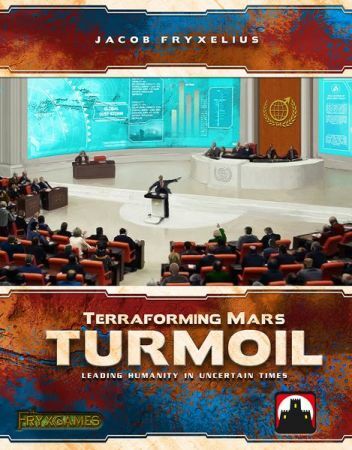 Terraforming Mars: Turmoil will be the only expansion to be released in 2019. It will be released via Kickstarter, and the campaign is live, check it out here. However, it will also be avaible at Essen 2019. This has been confirmed by Jacob. 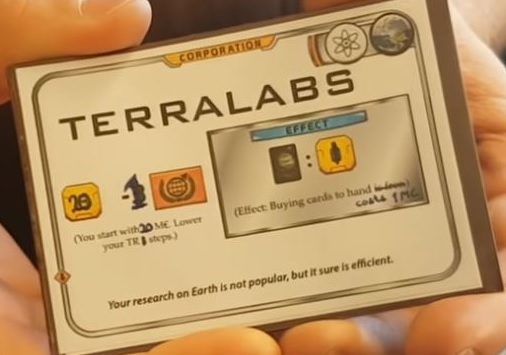 May very well be the final big expansion to Terraforming Mars, but we have our doubts, it IS a cash-cow after all. It will be an “expert” expansion, meant for more experienced players. Politics will be a major part of this expansion; Mars has estblished a Martian Senate, with different polical parties with their own agendas. The political aspect will take place on a new board, the Terraforming Committee Board. 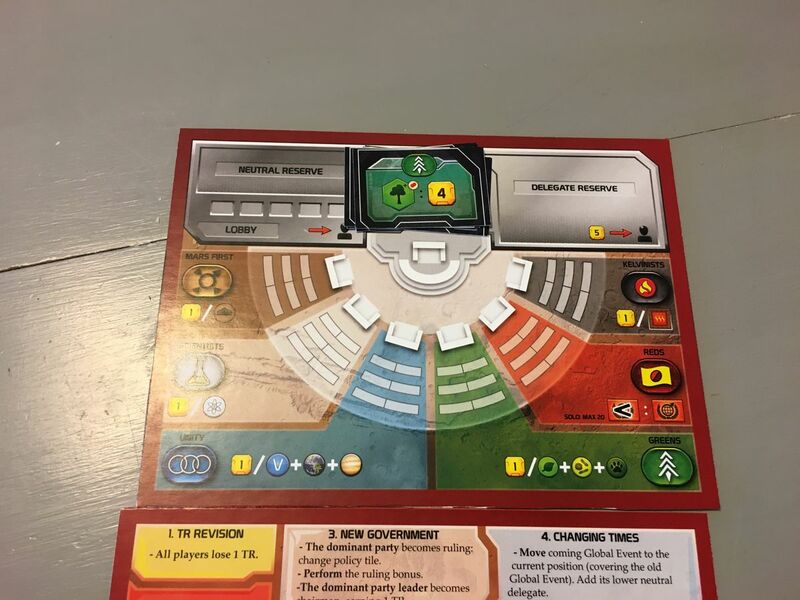 Here, players will influence the 6 political parties on Mars; The Mars First Party, The Scientists, The Reds, The Greens, The Kelvinists, and The Unit Party. Players will place their own delegates and vote for the different parties, placing 1 delagate is free, the rest cost 5MC each. All players have 6 delegates each. When are party is elected as the "Ruling Party", they will impose their policies, which will result in various bonuses, penalties and rulings on the various mechanics in the game. Example: The Greens will give you 4MC each time you place a greenery while they are the ruling party. Each party also gives you different bonuses when they are elected. The Terraforming Committee Board. Keep in mind that these are prototype components! Of course, there are loads more to this part of the expansion than this, but let's not spoil it all, shall we? Like we have mentioned before, this expansion consists of two modules, where politics is the first, and global events the other. Like the name suggests, these events will affect the whole planet, and therefore all players. These events will be drawn from a deck in and placed out face up so you will know what is coming 3 generations before the event is activated. Some events will affect the players in a negative manner, and some will give them boosts to production of certain resources etc. Some events will interact with politics aswell. INTERESTING! The global events. Keep in mind that these are prototype components! Playing with the Terraforming: Turmoil modules will add no more than 5 minutes of playing time per player. The kickstarter is in full swing! Check it out here. While you are waiting, pick our favorite expansions Colonies here, and Prelude here. A whole new game, based in the Terraforming Mars universe (yes, we said it, same universe), seems to be in the works, and is projected to be released some time 2020. According to Stronghold, Rob Devaiu, the co-designer of Pandemic Legacy games, Risk Legacy and Seafall, is working on the game. Needless to say, Terraforming Mars Legacy is destined to be a great game, if you are a fan of the genre. Dig these news? Dig the site? Please link to us from your social media of choice, blogs, or whatever. Everything helps! Thanks! So, what are YOUR expectations from the expansion and/or the legacy game?